All I can say is ... what a week! After 45 long years, the Tim Horton’s Brier finally returned to St. John’s, Newfoundland and Labrador. It was a long overdue and a highly anticipated return. It all started a few years back with a simple tweet. We were playing the Brier in Edmonton, ironically where we are about to play the world championship, when it was announced that Kamloops, British Columbia was awarded the Brier in 2014. That got me to thinking — St. John’s has a higher population, our venue can hold more people, our Patch would hold more people, and our airport is more accessible … well, weather permitting. It took on a life of its own. When I returned home from that Brier, I began meeting with city counselors and various other representatives from the city. 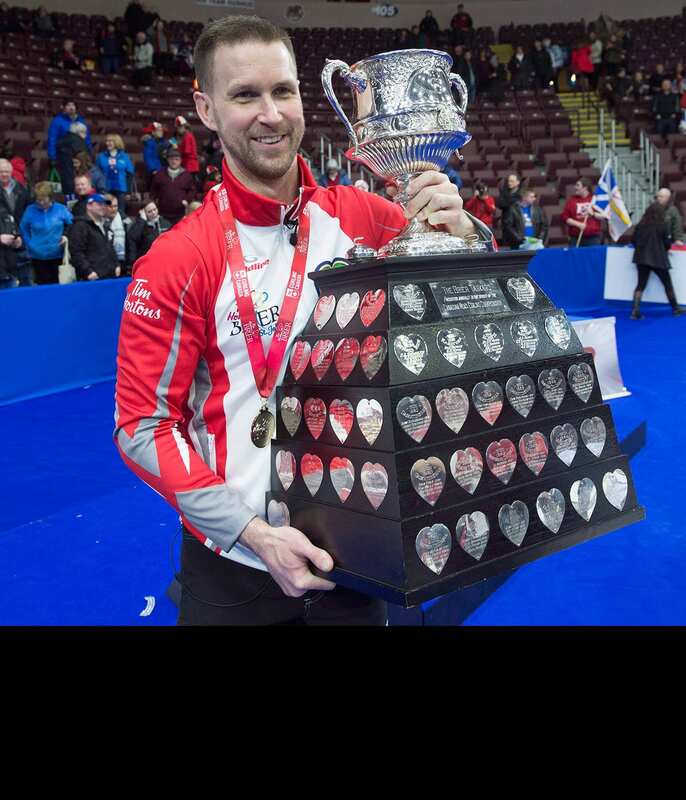 Things began to happen and St. John's was awarded the Brier in the fall of 2015. Immediately, my focus shifted to representing Newfoundland and Labrador at the 2017 Brier, and hopefully winning the event. All our preparation was geared towards it. We actually spent two days in June planning all the finer details involved. We worked through everything we could think of, down to where and what times we would eat. We had a plan for walking to the rink, dealing with family and friends, and just about any other scenario you could think of. We knew we were going to feel the pressure of playing at home. It had been 45 years and we were the No.1-ranked team in the world. The province’s expectations were understandably very high, but so were ours. We knew that we needed to find a way to make the event feel a little more like a regular event. By planning everything with such detail, we were able to eliminate all unnecessary distractions and just focus on what was happening on the ice. While you can plan, you can’t plan for everything. When we first walked out on the ice, we had no idea the amount of pressure we would feel. But also the appreciation and support we received from the crowd was so overwhelming. I took my first practice slide and received a standing ovation. Amazing! But I was so nervous. My legs were shaking so much, all I could focus on was trying to stay upright. There was no way that I was going to perform my signature wipeout move again, let alone on home ice. The first few games were certainly a challenge for our team. We were playing okay, but not to our usual standard. Things just looked sloppy. By Tuesday morning, we were 3-1 and in decent shape. We had a game against the Northwest Territories. On paper, it was definitely a game that we should have won. But we came out extremely flat and there was no spark. We were not doing the little things that make our team successful and we lost 8-4. It almost appeared as though we were trying to be too even-keeled. We had overcompensated for the situation we were in. I called a team meeting after that game and things got a little fiery. You could see and feel the pressure in the room. We knew we had to change things or we wouldn't like the end result. We decided that we were going to do two things: focus on the all the little things we need to do to make shots and embrace the crowd. If anything we were going to overcompensate on the energy side. We felt if we got the crowd going, we could ride their enthusiasm for the rest of the week. Several people have asked me what the turning point was for us. It would be easy to say that the meeting was the turning point, and it probably was. Following that meeting, we had a game against Northern Ontario — Team Jacobs. They were a pre-event favorite and ranked as one of the best teams in the world. During the Brier, both teams had a draw to the button following their practice to determine who gets the last rock in the first end. If both teams cover the button, they actually triangulate the measurement to see who covered it better. Team Jacobs had first practice and on their draw they covered the button almost perfectly as their measurement was two centimetres. It was the best draw of the week up until that point. The turning point for me was on our draw to the button. It was the first shot we had played since the meeting. You could see the intensity, attention to detail and the precision we had on that shot. Our draw stopped at 0.6 cm. I knew after that draw, we were on the right track. We started to adapt to our new situation, discovering that we could offset the pressure we were feeling by embracing the intense emotions and the crowd. We began to openly celebrate great shots we made and engage with our fans. The crowd was electric and our team began to feed off of them. Everyone knows how the week and the final turned out. The party after was just as epic. The final finished around 11:30 p.m., we spent a couple hours filling out paperwork for Curling Canada and celebrated with our families and support team. Around 2:00 a.m., we were transported over to the Patch (huge party area at the Brier), where there was a maximum capacity crowd of between 1,500 to 2,000 people waiting for us. We were brought up on stage to say a few words to the crowd, and it was probably the first time in the 90-year history of the Brier Tankard that it went crowd surfing. We wanted to share the trophy with the people that supported our team and the city in getting the Brier. The night went on until we ordered breakfast at 7:30 a.m., after that I put the Tankard to bed next to me and called it a night. It was a night I will never forget, and one that I didn’t want to end.